2002 First edition. Rules in German and English. Played four times by me. Game is complete and components are in very good condition. Box has three or four stains on the top, the largest about the size of a quarter. Box still has good structural integrity. 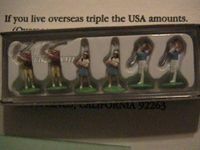 My copy also comes with the pieces from Golf, the Game, including the plastic case.